Snapchat's filter library is vast, varied, and now apparently somewhat plagiarised. 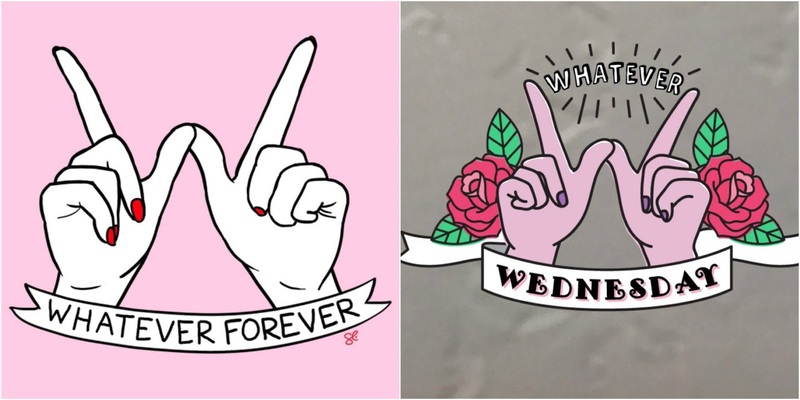 They recently added a filter which depicts a pair of hands making the 'whatever' symbol. It's nothing mind-blowing, in fact it's one of the more dull recent additions to the filter library, but it may well have landed Snap in a bit of trouble. An artist named Sara M. Lyons has pointed out that she created an almost identical design (for which she owns the copyright) back in 2013. The banner is different and Snapchat's version includes a kind of floral border, but the design of the fingers is very, very similar. As you might expect, Lyons isn't exactly thrilled about this, and although she hasn't announced any plans to file suit yet, she's raging pretty hard on Twitter. Were she to sue, it would likely be a long, drawn out and most likely unsuccessful court battle. The value of the filter would have to be quantified and weighed against the value of the art itself, which is difficult, as is claiming this kind of work as intellectual property, even when it is registered with the US Copyright Office, as in this case. What Lyons has done is asked Snapchat to get in touch with her personally, presumably either so she can ask them to take it down, or give her credit. It's unclear whether Snapchat actually did get in touch with her or not, but word clearly reached them somehow, because they've just taken the filter down, citing similarities to Lyons' design as the reason (although they did point out that there are distinct differences between the two designs). They also referred to the similarities as coincidental. In all honesty, it probably was a coincidence. The similarities are striking, but the general design is so widespread that there are hundreds of versions of it out there in the world, Snapchat were just unlucky enough to use one which looked a lot like another. The fact that they've been so courteous about it also suggests that it was a simple mistake, they're not the most morally reputable company in the world but they're certainly not the least either, and stealing isn't really their jam. That being said, this isn't the first time they've been accused of lifting artwork. Last year a geometric face filter landed them in a similar predicament after it was compared to the work of artist Alexander Khokhlov. They were similarly apologetic, and that incident was far harder to pawn off as a coincidence. In truth, it's an issue of generating ideas. Taking inspiration from real world art for filters is fine, but take too much and all of a sudden you've stolen somebody else's idea. It's a fine line.